A very important public consultation is taking place in Camden on the future of the Tavistock Place ‘cycle scheme’. This runs along some side streets well away from the main roads in central London. Under normal circumstances putting the words ‘cycle scheme’ in quotation marks would herald a critique of a mad, bad or pointless project of the sort which we see too much of in Britain. But on this occasion I use the quotation marks because, while this consultation is primarily about a high-quality scheme, it is about more than cycling. The consultation is about the type of city that can be built in the twenty-first century. It is about whether we start switching towards a liveable city serving people, or whether we continue to cling tenaciously to a twentieth-century model of an urban realm dominated by motor vehicles. 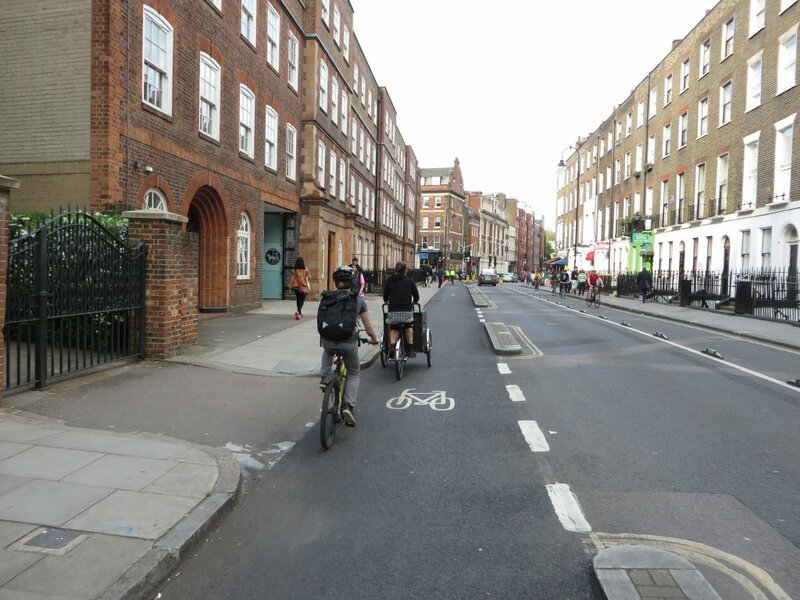 The proposed cycle scheme on Tavistock Place has been trialled (using a temporary layout) since October 2015 and has generated enormous favourable comment, especially from cyclists and from pedestrians in the area. The traffic reductions have been achieved by allowing motor traffic to drive in just one direction (while ensuring maintenance of access to the whole area by those who need to use motor vehicles). It has recently been reported that poisonous emissions in the area are down 21% since the start of a trial. So much motor traffic uses the route that cabbies insist that this is not a side street, but a ‘main road’. Taking this argument (for the time being) at face value, it raises an interesting question of balance. There is now a consultation on whether to implement the cycle route as a permanent feature. 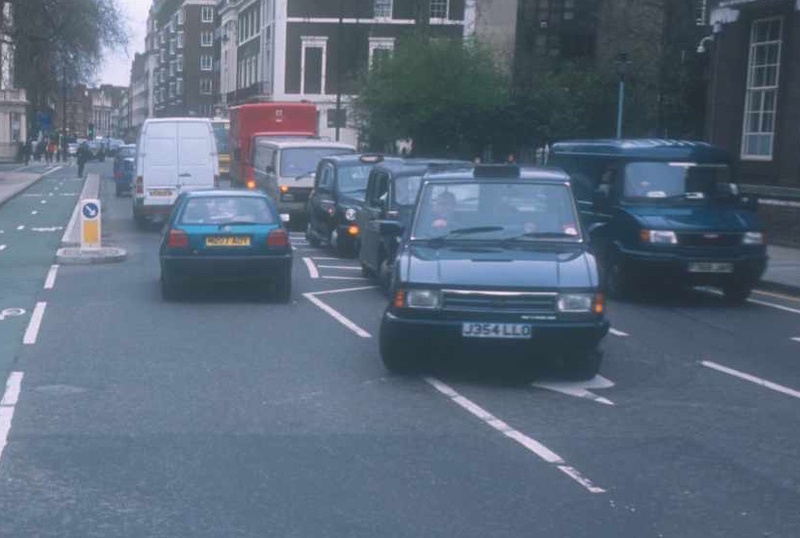 But there has never been a consultation on allowing side roads to become so clogged with motor vehicles – to such an extent that all side roads become transformed in popular cabbie and motor lobby discourse to be main roads and, thus, can never be subject to measures aimed at reducing motor vehicle traffic, minimising congestion and lowering pollution levels. 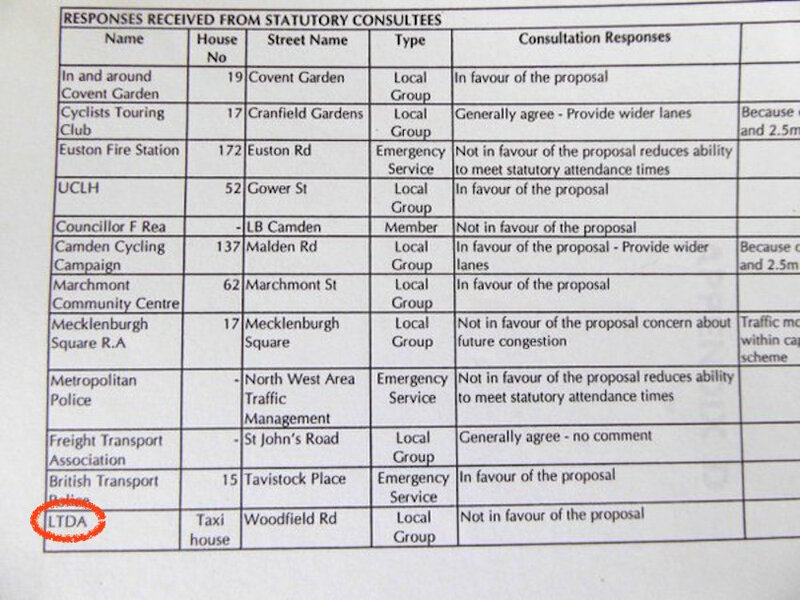 In essence this consultation is about that issue, not just about a cycle route. This is our consultation on whether we ever approved of the policy of allowing motors to become the dominant force in our capital city public spaces. Before looking at some more of the detail of the debate, some background may be useful for those not familiar with the history of the cycle route. 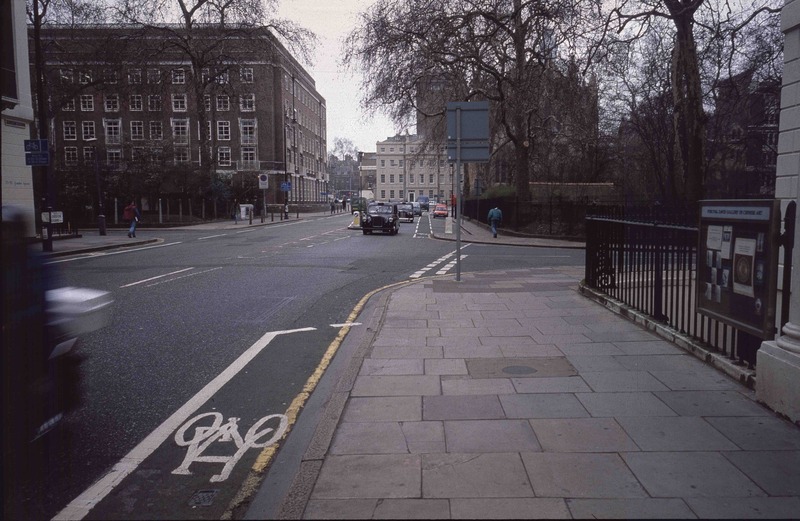 First, there has been a cycle route on Tavistock Place since the year 2002 when a two-way, physically separated cycle track was installed and ran on one side of the road. 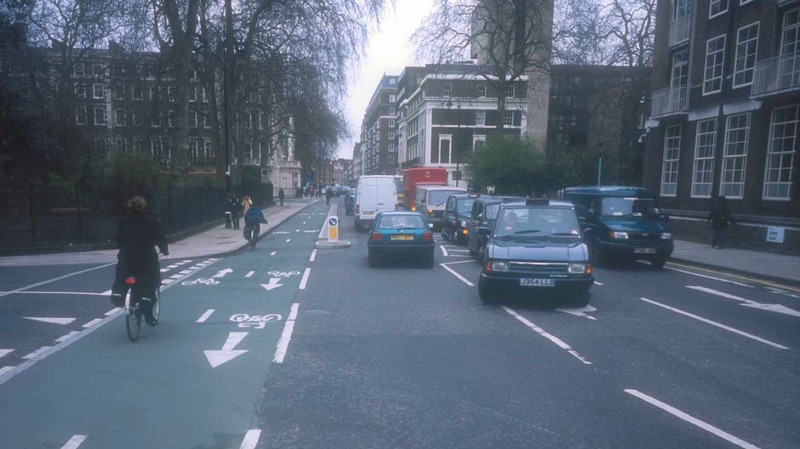 This proved to be progressively more popular and within a couple of years there were simply too many cyclists wanted to use the facility for the safer, more attractive cycling conditions – the only such facility at the time in central London. In October 2015 an experimental system of two one-way cycle tracks (one on each side of the road) was introduced. The present consultation is whether to make the trial approach permanent (and importantly to upgrade the quality of installation very significantly over the temporary methods used for the trial). It is currently the busiest cycle route in the borough of Camden, and one of the busiest cycle routes in the whole of London, with over 1,000 cycles counted in the morning peak hour. I should declare an interest here as I was one of those involved in Camden Cycling Campaign (now Camden Cyclists) that persuaded the London Borough of Camden streets and environment committee (led by its chairman Councillor Gerry Harrison) to install the two-way physically separated cycle track 14 years ago (along with another two-way track on Royal College Street about one kilometre north of Tavistock Place – this site has already been upgraded to two one-way cycle tracks). The term ‘Tavistock Place’ is something of a misnomer and is just a useful handle for a route that actually runs along a side road on a roughly east-west axis with a variety of street names, running from Tottenham Court Road in the west, along Torrington Place, Byng Place, Gordon Square, Tavistock Square and Tavistock Place, to Judd Street in the east. Its course runs pretty much in parallel with the Euston Road (which is a multi-lane main road, the A501) about 0.25 kilometres to the north. The only other continuous east-west route through the area is another main road (A40) about 0.75 kilometres further south on Bloomsbury Way/Theobalds Road. Neither route is suitable for cycling. An intermediate east-west route using Bayley Street, Bedford Square, Montague Place, Russell Square and Guildford Street, is currently unsuitable as it is a secondary main road (B502) and would require an awkward routing around the heavily used roads on Gordon Square. The area is roughly known as Bloomsbury and includes a number of important destinations including the sprawling University College London (UCL) campus, University College Hospital (UCH) and other hospitals, and the British Museum as well as having three major railways stations (Euston, St. Pancras International and King’s Cross) on the northern side of Euston Road. Torrington Place at the west end of the route, cuts right through the centre of the campus of University College London’s Bloomsbury site, effectively slicing it in half. I can recall Torrington Place twenty years ago when the volume of motor traffic it carried was significantly less than in recent times. We have – with no consultation remember – allowed this minor side road through the centre of one of world’s leading universities, to become a choking, fume-infested, frequently congested rat run for taxis, delivery vans and cars. But we are so accustomed to traffic clogged streets in London that we don’t even think about how crazy it is to have allowed this situation to develop in an unplanned fashion, through the carelessness of successive governments. Torrington Place without the two one-way cycle tracks is a monument to the complete failure of the generalized governance of London’s public space. It is good to see the London Borough of Camden trying to do something to change its streets and to think about creating better conditions for cycling and walking as transport modes. Indeed, even if one has quibbles with some details, the proposals out for consultation are radical not just in the idea of giving pedestrians and cyclists more space (and safer space), but also in the aesthetics of the road design in the area – challenging the standard British urban road design of a central channel for motor vehicles abutted by available space for a pavement. Some 50,000 to 60,000 students are based at the UCL Bloomsbury buildings, many of them travelling there by foot or by bike. Over 1,800 pedestrians were counted during the morning peak hour in Torrington Place at the heart of the campus. The number counted between 1pm and 2pm in the same place was 2,580. It is obvious that we need to cater better for the large numbers of non-motor vehicle users. As a society we have chosen to dump heavy debts onto students in the form of tuition fees. The least we can do is enable them make use, in safety, of cycle routes so that they can enjoy the benefits of exercise and flexible as well as a very cheap means of getting around the city in which they study. Similarly, there is every reason to provide the same opportunities to people who work in the area, many at UCL & UCH, but also at the thousands of small businesses that make this such a vital location for one of Britain’s most important export industries (in media/publishing/music etc) and in other sectors. Hardly any of these people drive to work here. Apart from those with expense accounts and the affluent, who may arrive by taxi, nearly 100% of tourists and visitors to the British Museum arrive on foot (with just shy of seven million visitors last year, it is the most popular museum/gallery in Britain). Counts conducted by the council show that cycling as a mode of transport accounts for 43% of all users on the Tavistock Place route, pedestrians for 41% and motor vehicles for just 16%. But, before the current trial system was introduced, cycling was accorded just 13% of the actual road space, pedestrians 44% and motor vehicles 43%. Under the proposed upgrade these figures would be rebalanced with 33% of road space devoted to cyclists, 46% to pedestrians and 21% to motor vehicles. But this potentially game-changing scheme faces visceral opposition from the cabbie lobby, one wing of which, the London Taxi Drivers’ Association (LTDA), bizarrely, has launched its own parallel (and unofficial) consultation full of leading questions. It can be assumed without further explanation, of course, that they actually mean busier with motor traffic, but that is to be expected. They only think about motor vehicles. “Thinking about the whole area” (as per their leading question), they do not wonder why we have allowed every side street within it to become a rat run. Their only concern is the ability to drive unimpeded everywhere regardless of suitability of the area for through motor traffic. The LTDA which set up this survey of cabby opinion, does not represent all cab drivers in London, of whom there are about 23,000. But clearly it is trying, not to gather real evidence of motor traffic levels by counts, but by asking London cabbies for their opinion. This opinion will then be presented as ‘fact’. This is not very convincing. According to LTDA statements, they want to return to the pre-trial situation which would mean restoring the two-way cycle track (unless they really want to go back to pre-2002 with no cycle track at all). 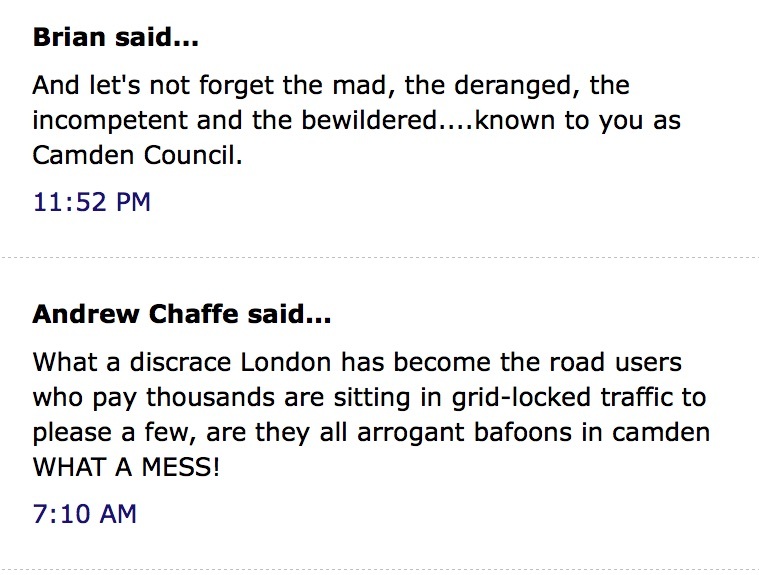 But back in 2002 the LTDA was among those who opposed the two-way cycle track being installed. LTDA opposition to cycle schemes is a deeply ingrained, reflexive action, as are anti-cycling views in other bodies which organise cabbies, including the unions Unite, RMT and GMB. 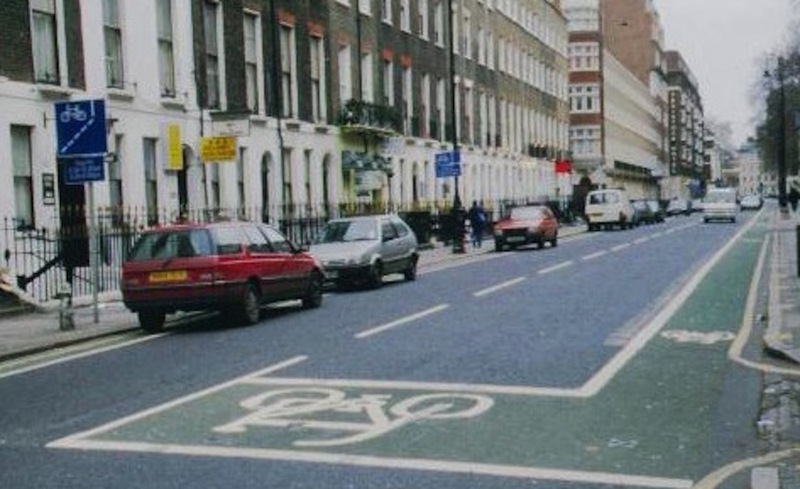 Here it is objecting in 2002 to the two-cycle lane it now wants to revert to! It’s worth looking at another closely related cycle scheme, on the Embankment and run this time by Transport for London (TfL), the London-wide authority with responsibility for main roads. This was implemented around the same time as the Tavistock Place trial, and we can see that the arguments now being deployed by the cabbie lobby were pre-prepared for the Embankment. In the information war, truth is the first casualty. Daniels added, “I was charged with delivering segregated Cycle Superhighways to cope with the growing number of cyclists and to improve their safety. The final results are excellent and we are now moving on to further schemes to benefit walking and cycling.” Thus the man in charge of implementing the scheme sees its benefits and is keen to do more. Early reports (https://www.theguardian.com/uk-news/davehillblog/2016/sep/21/how-many-londoners-are-switching-from-public-transport-to-bicycles?CMP=share_btn_tw) show that cycling levels are increasing on the new TfL routes (just as happened with the earlier Tavistock Place scheme). Chronic congestion on the underground railways is being reduced by people switching to cycling even with the limited short sections of safe protected cycling space that have been installed (calculated to be on about just one-fifth of one percent of London roads). Given that the Underground regularly has to shut stations at peak periods due to dangerous overcrowding on platforms and trains, the cycleways are the best possible investment in improving public transport for all users. But the taxi lobby was predicting doom and dire congestion – even before a single bit of work had been done. Now they are gathering their ‘evidence’ by asking cabbies for their opinions to back up their claims. At least this time he admits it is his own view, but it shows how the taxi lobby will put forward any ill-informed nonsense in their blanket opposition to improving the city and to preventing any road space being given over to non-polluting, non-congesting forms of transport. 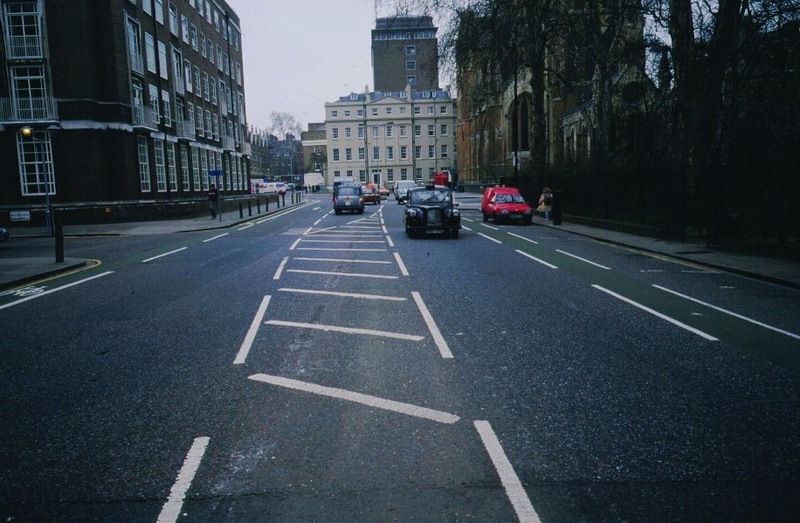 If the cabbie lobby is able to overwhelm the council with negative opinions about Tavistock Place – however fanciful and however false – and the liveable cities lobby fails to get in lots of positive responses, this pioneering scheme may meet its end. Please spread the message and get lots of people to take part in Camden’s consultation. 70% of statistics are made up….. Your lcc meetings on Chalk Farm Rd in the 90s were equally boring. You love yourself too much Paul. Enjoy Wales. 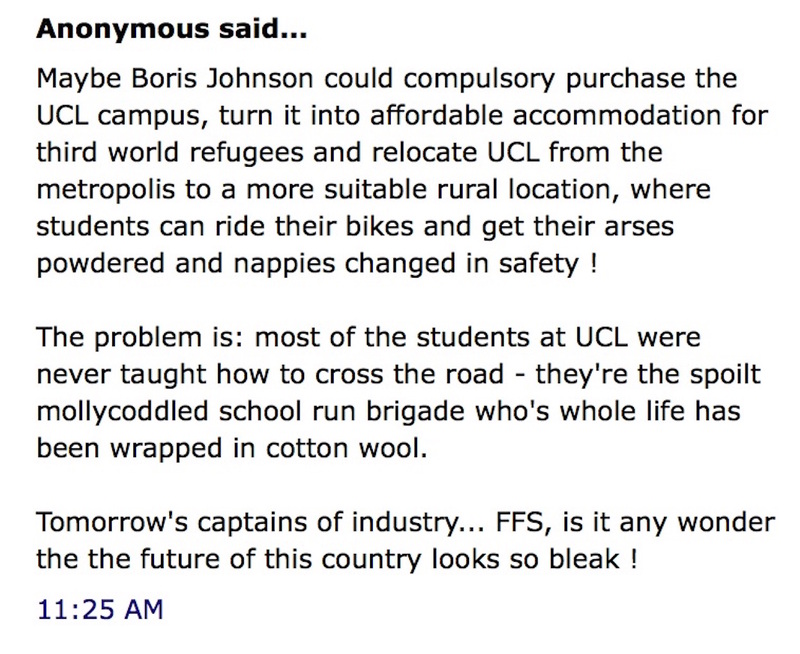 Leave London to Londoners, lots of us don’t want segregation. I don’t need segregation for myself but I certainly want it for my children and I believe there are many non-cyclists who would cycle with better segregation. 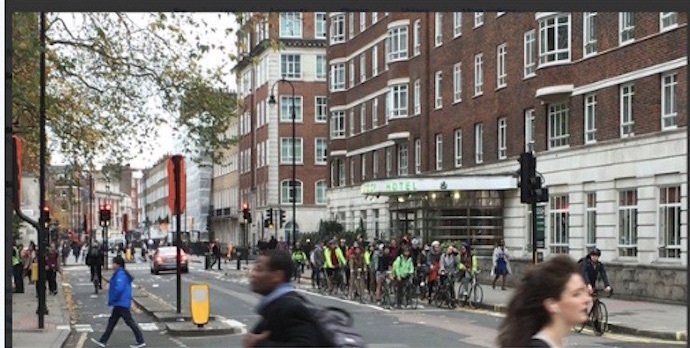 It’s not about me, Phil, or indeed about you, but about all those people who are enabled to cycle because of segregated cycle tracks – & the increasing numbers of people on bicycles show just how popular they are. Good post. The key metric has got to be (People moved per hour/air pollution, especially given London is in breach of legislation on air quality). Black cabs are for tourists and a small number of business people – they should only have a voice in proportion to the proportion of people they can shift (divided by the pollution they cause). Tavistock place is a minuscule step in the right direction, those opposing it are only motivated by self-interest not the greater good. 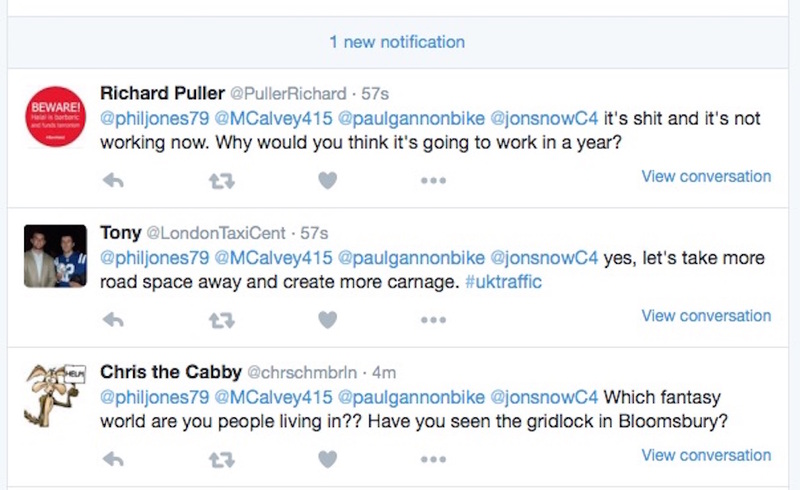 Death threats by cabbies toward cyclists are common and very frightening. LTDA members declare that any cyclist not using the CSH is “fair game”. Others boast about using their vehicle as a weapon against cyclists. The level of hatred is astonishing, I can only imagine these cabbies don’t know anyone who cycles, their enmity is so deeply irrational. You can look on Twitter, cabbies openly boast about dangerous driving near people on bikes. As a frequent pedestrian in the area, this is all very interesting, but I would question whether it “has generated enormous favourable comment, especially from cyclists and from pedestrians”. Well, certainly not from pedestrians! And not from this one, or my work colleagues who are similarly affected. The behaviour of the average cyclist using this scheme is appalling. Most, and I mean most, as I have frequently observed their antics from a stationery standpoint, pay little regards to pedestrian crossings and traffic lights. They frequently ignore pedestrian crossings, crash traffic lights and ride on the pavements – and have in fact made it less safe for the areas’ pedestrians, despite what some claim. The main problem is with the zebra crossing between Gordon Square and Woburn Square. Most cyclists pay no heed whatsoever to pedestrians waiting to cross there, even if motor traffic has stopped to allow them to cross. In the rush hour they ‘hunt in packs’ and even if one or two cyclists slow down, seeming to allow pedestrians right of way, which of course they have, are inevitably forced to keep moving by bands of aggressive lycra-clad riders behind! If you dare to remonstrate with any of them, they are rude and arrogant in response. I am also a cyclist, but I do not use, and would not use, such segregated cycle lanes. I feel much safer just riding in amongst general traffic. It is becoming clear however that drivers are becoming less sympathetic to cyclists in London, because of their bad behaviour. This is a shame as, hitherto, we got on famously in integrated traffic. Whatever their views, most cyclists in London do not deserve the money and effort being spent on them, and until they start behaving and follow the rules of the road, I do not think they should be afforded any further ‘schemes’. This particular scheme has not been a success from the pedestrian point of view, and nether was its’ predecessor, ie the two-way cycle lane. It looks as though however we will be stuck with at least that, but I personally think the cycleways should be removed and the road returned to two-way integrated traffic.